This summer we spent a considerable amount of time in France. On the road from Lisbon to London in the van we took a few weeks winding up through the centre, in search of cute places to eat, explore and camp. We came for the landscapes and stayed for the food. My word, does this country earn their reputation as next level food savants. We were greeted by farmers, home gardeners and winemakers like old friends everywhere we went. Just going to to a little village market steeped in tradition and history, could be an all day food adventure for us. We bought local produce and cooked or prepared it in the van in the carpark most days, literally market to table in minutes. We stayed in regions around Normandy, Dordogne, Loire Valley, Bordeaux and Carcasonne. Everywhere had their speciality of the region, mushrooms in the caves in the lower Loire, Cider and washed rind cheese in Normandy, and of course some glorious wines in Bordeaux. In a little village called Availles en Châtellerault we found a nut farm, run by a family who have been producers of culinary plant-based oils since 1810. With the van parked between the rows of lush walnut trees on the edge of a golden wheat field we wandered across the road to the farm HQ, where we were treated to a tour of the farm and learnt how these oils are produced. The Lepine family has been producing walnut and hazelnut oil - an ancient tradition producing a flavour which is unlike any other. In the process the kernels are crushed and ground into a thick paste, then the paste is fried until it browns - this a difficult and the most delicate part of production because the savoury taste depends on the frying. The paste is then poured into a hydraulic press where the wonderful, golden oil drips out. Walnut oil is a healthy oil thanks to its high vitamin content and the quality of its fatty acids which actually help lower cholesterol levels. Liquid gold with endless possibilities and health benefits - I was stoked to say the very least. We took our own bottles and received a bottle of both walnut and hazelnut oil, plus we took home some walnut mustard, and hazelnut flour made from the by-product of the oil making process. It is amazingly tasty (think Nutella flavoured flour - heaven!) and such a smart way to use the entire plant with #zerofoodwaste. 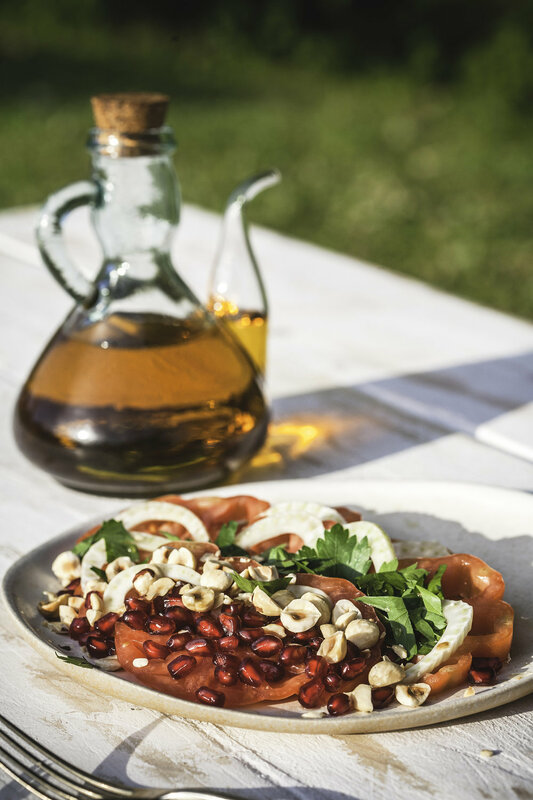 We made a delightful salad using the oil, I hope you can get your hands on some walnut oil and give it a go. 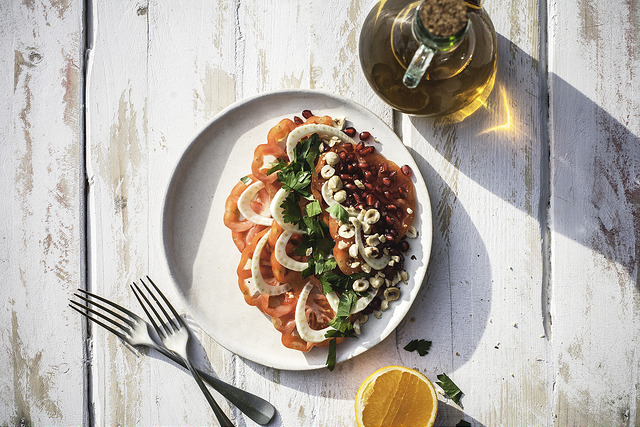 Place sliced tomatoes and fennel on a board, serving dish or large plate. Sprinkle with sea salt, squeeze orange juice from cheeks, drizzle with walnut oil and leave for a few minutes to cure. Crush hazelnuts/walnuts roughly using your hands, peel pomegranate and tear or chop parsley and sprinkle everything over the top, then finish with a big grind of pepper. 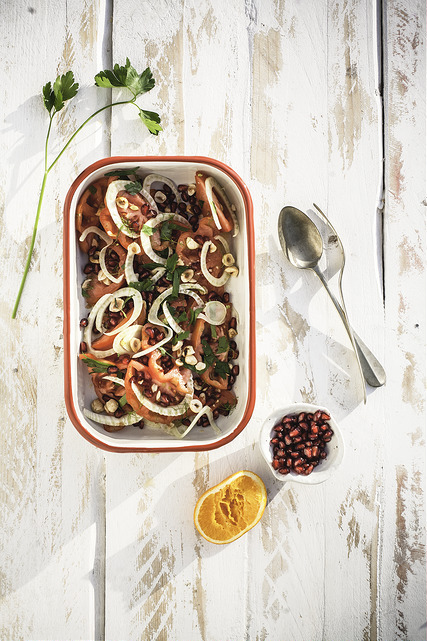 Serve with bread as a quick roadside lunch, or as a side with a risotto or pasta dish. For more information on Huilerie Lépine click here. To find French farms to stay on with your van or motorhome click here.